CNN) -- Vice President Joe Biden expressed doubts Sunday about the validity of Iran's presidential election, but said it will take time to analyze the results. 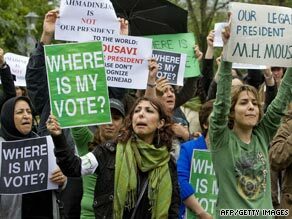 Iranians demonstrate near the Iranian Embassy in The Hague against the President Ahmadinejad's victory. "I have doubts, but withhold comment," Biden said on NBC's "Meet the Press." Biden said the Iranian government has suppressed crowds and limited free speech, which he said raised questions. He also called the strong showing by Ahmadinejad "unlikely," based on pre-election analysis. "Is this the response, is this the accurate response, is this the wish of the Iranian people?" Biden said. Despite the questions, Biden said the government would continue working with its allies to prevent Iran from developing nuclear weapons, which could mean direct talks with the Iranian government. "The decision has been made to talk," he said of the allied effort. "And we're signed on to that." "We're not going to allow Iran to go nuclear," said Biden. Ahmadinejad won Friday's election with 62.63 percent of the vote, the Iranian government announced. The result sparked protests by supporters of his main rival, Mir Hossein Moussavi, who claim the vote was rigged. Israel warned Sunday that the re-election of Ahmadinejad represented "an intensification of the Iranian threat," and called for redoubled international efforts to halt its nuclear program. "After Ahmadinejad's re-election, the international community must continue to act uncompromisingly to prevent the nuclearization of Iran, and to halt its activity in support of terror organizations and undermining stability in the Middle East," Israeli Foreign Minister Avigdor Lieberman said. His deputy, Danny Ayalon, suggested that even if Moussavi had been declared the winner, Tehran would still pose a threat. "Israel had no illusions regarding the elections, as on these two issues there was no substantial difference between the candidates," he said. Hamas, the militant Palestinian movement backed by Iran, welcomed the results. Hamas spokesman Fawzi Barhoum urged the world to respect Iranian democracy and accept the results of the elections. Meanwhile, the BBC reported that electronic jamming -- which they traced to Iran -- was disrupting its satellite feeds to some viewers of BBC Persian in Iran, the Middle East and Europe. Two BBC journalists were also briefly arrested while doing their jobs, according to a company statement. "It seems to be part of a pattern of behavior by the Iranian authorities to limit the reporting of the aftermath of the disputed election," Peter Horrocks, director of BBC World Service, said in the statement. "Any attempt to block BBC Persian television is wrong and against international treaties on satellite communication. Whoever is attempting the blocking should stop it now." Hamid Karzai, the president of Afghanistan, which borders Iran, called Ahmadinejad to congratulate him, Karzai's office said Sunday. Karzai's view was that "relations between the two Muslim nations of Afghanistan and Iran expanded during Mr. Ahmadinejad's first term and hoped that these relations get stronger during his second term," the statement said. The day before, about 100 people protested in front of the Iranian Embassy in London. "It was completely unbelievable, especially with the turnout and everything," said one British protester. "It was obvious from the beginning that it was all rigged." "Everyone was sure that ... Moussavi was the winner," said a woman at the demonstration. "People wanted change, people wanted -- you know, not democracy in a sense of Western democracy, but the democracy that we were hopeful of." UK Foreign Secretary David Miliband said his government was monitoring the election. "We have followed carefully, and admired, the passion and debate during the Iranian election campaign. We note the result as announced by the Iranian Electoral Commission. We have also heard the concerns about the counting of ballots expressed by two of the candidates. "This is a matter for the Iranian authorities to address. We will continue to follow developments. Our priority is that Iran engages with the concerns of the world community, above all on the issue of nuclear proliferation." "People have gathered here to express their distrust of the government in Iran, which has really turned a very genuine election into a sham, and has basically stolen people's votes in order to maintain a regime that is seriously not wanted by the Iranian people," said protester Robert Babeyi. Babeyi said he moved from Iran to the United States more than 30 years ago, but stands behind those Iranians who he feels have been wronged. Canada's foreign affairs minister said Saturday he was worried about reports of irregularities in Iran's election, while the U.S. secretary of state said the United States hoped the outcome reflected the will of Iranians. "Canada is deeply concerned by reports of voting irregularities in the Iranian election," Canadian Foreign Affairs Minister Lawrence Cannon told reporters in Niagara Falls, in Ontario, Canada, where he appeared at a briefing with Secretary of State Hillary Clinton. CNN's Shira Medding in Jerusalem and Greg Clary in Washington contributed to this report.